I hope everyone had a great time bringing in the New Year. 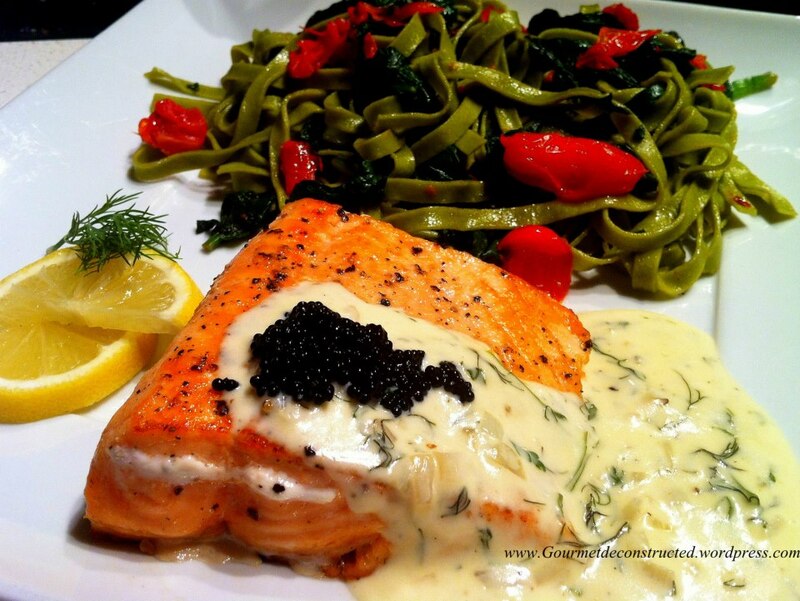 I will kick off 2013 with a great tasting and easy to prepare salmon dish. It actually ended up being a Swedish/Italian fusion of flavors. But before I give you the recipe, let me tell you about some of the fun things I did last month and what inspired me to cook this dish. December was a very busy month for me filming the online cooking show “Neighborhood Chefs“, which I am executive producer of. I often get to meet many interesting chefs and home cooks during our tapings and December was no different. While on Facebook I became good friends with Mats Melander, a cook from Sweden who competed in the Swedish TV version of “Masterchef”. He introduced me to two more great cooks from his country, Christer Söderberg & Per Ehrlund. These guys were set to pay a visit to Brooklyn to compete in a food competition. How could I pass up a chance to have them cook in our NC’s kitchen? The chefs arrived bright and early with a ton of enthusiasm and plenty of jokes. They seemed to enjoyed their stay in NYC, heck, Per Ehrlund even got married while they were here! They also arrived with some gifts for me from Sweden, Salma salmon and Vasterbottensost cheese. The cheese was some of the best I have ever tasted. It had a taste similar to a high quality Cheddar cheese. The cut of fish here is the belly loin, and it was so good that I could not stop eating slices of it before it was even cooked! Anyway, the chefs did not disappoint, as they went on to cook some fabulous food and kept us in stitches with their comedy while doing so. I also got to see another great chef make his second appearance on the show, Chef Shehu Fitzgerald from Staten Island, NY. Shehu is a well-traveled cook with a skill level much higher than your average chef. He proved this on the popular Food Network TV show “Chopped”. He blew away the competition in all three rounds to become one of the show’s champions. He has opened a restaurant in his neighborhood called “The Phunky Elephant” which I have also visited. For the taping he quickly prepared 5 dishes from his new menu. Wow, I was impressed! We were also visited by Chef Eddie G from Coast2Coast cuisine. Chef Eddie G and his partner JR travel the country filming at different Locations. They often take over local restaurants and create coastal dishes from around the world in an entertaining and educational food show, it is a high quality program focusing on travel and brand recognition. Although we did not get to see him cook on the show this time, Chef Eddie and I look forward to working together in the future, so stay tuned! And as if this wasn’t food overload already, the next day I attended the food competition at the Brooklyn Brewery. Now, on to the recipe. Keep in mind you don’t need to use Caviar for this dish, I used the caviar because it was something I purchased from a Swedish specialty shop. This recipe can be paired with anything from pasta to steamed vegetables. I chose to pair it with spinach fettuccine tossed with fresh spinach and mini San Marzano tomatoes. Bon Appetit! Baked Salma Salmon with Dill/Parmesan Sauce served with Spinach Fettuccine Tossed with Fresh Spinach and Mini San Marzano Tomatoes & Lumpfish Roe. Preheat oven to 350 degrees. On a lightly oiled broiler pan, place salmon fillets. Sprinkle with a little salt and pepper and Place in oven and bake for about 15 minutes or to your desired doneness. Salmon will turn reddish-pink when it is done. While that is cooking, in a medium saucepan over medium-high heat, heat the oil and 1 tablespoon of the butter until it melts. Add the shallot and cook until softened, about 1 minute. Add the wine and cook until reduced by half, about 3 minutes. Reduce heat to low and whisk in the mustard, dill, pepper, parmesan cheese, and the remaining salt. Remove from heat. Cut the remaining butter into pieces, add to the sauce, and whisk until incorporated and creamy. Place the salmon on individual plates, spoon the sauce over the top, and sprinkle with additional dill and Lumpfish roe and serve. Posted on January 10, 2013, in Food, Foodie Road Trips & Other Fun Things, Seafood and tagged baked salmon, brooklyn brewery, fettuccine, parmesan and dill sauce, Phunky elephant gastropub, Salma salmon, sushi grade salmon, Swedish cuisine, Vasterbottensost cheese. Bookmark the permalink. 3 Comments. What a delightful story; thank you for taking us along!! But, more so, thank you for a very elegant, but obviously flavourful, salmon recipe which i’ll prepare soonest! Well, just perhaps I’ll do without the lumpfish roe: have not been enamoured in the ones I have tasted: either it is proper Beluga or Sevruga, or we’ll just pretend that is there 😀 ! So colorful and inviting…very nice.